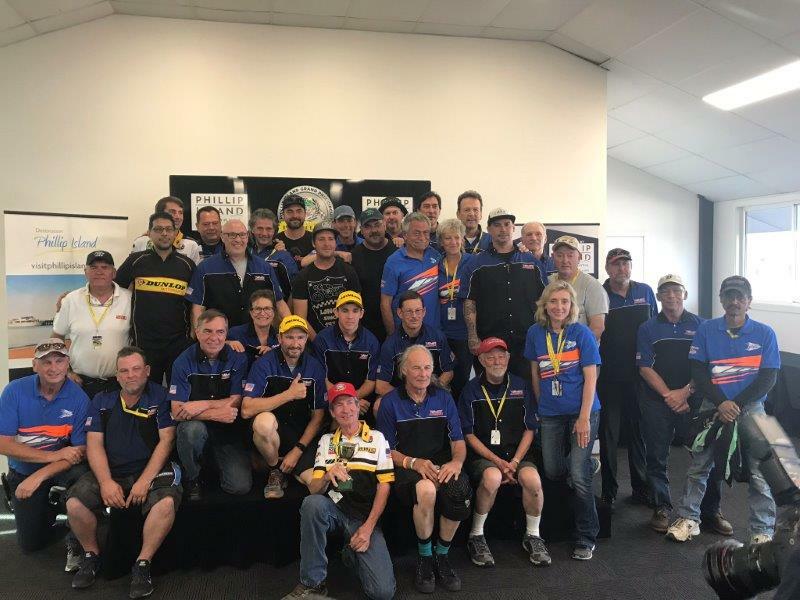 Next month the Phillip Island Circuit host the 26th Island Classic. 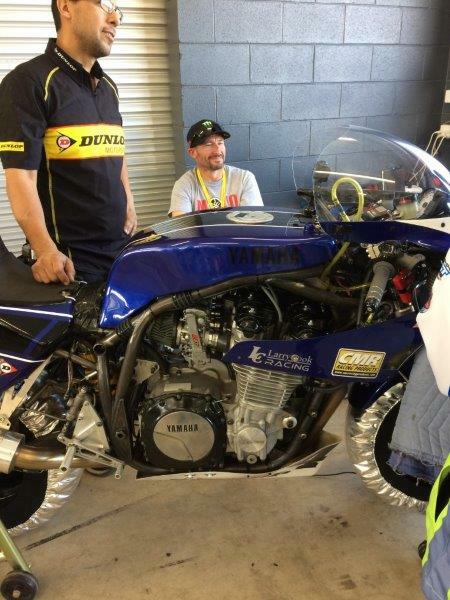 Roadracing World had a recent article on Dave Crussell's Mojo Yamaha Team. 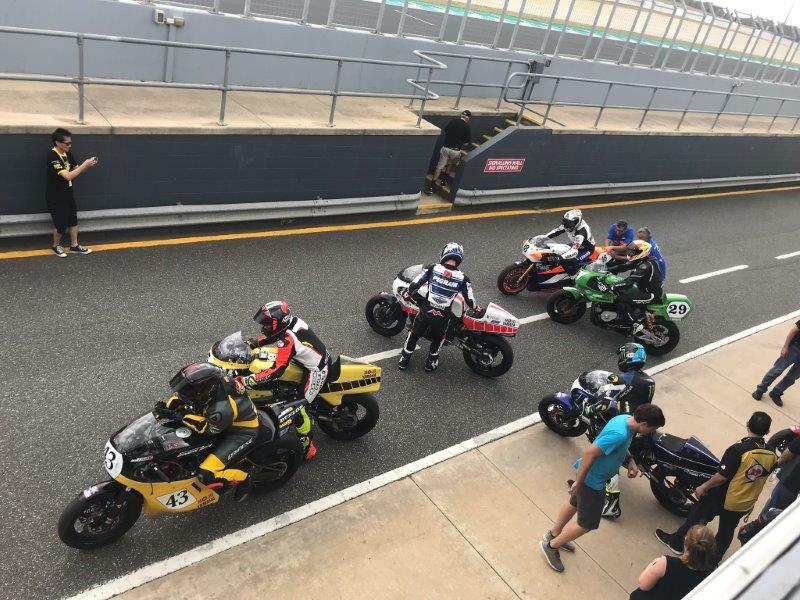 https://mojoyamaha.com/installment-1-mission-redemption/ Some serious talent on the America Team this year! Too bad Team UK will not be attending. 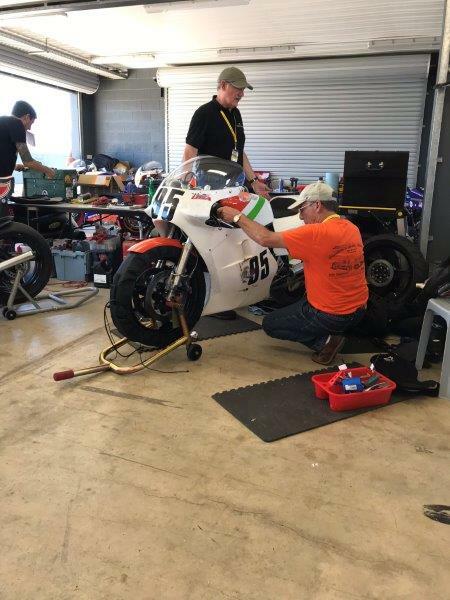 http://www.bikesportnews.com/news/news-detail/roger-winfield-sets-record-straight-over-2018-pi-classic My RG is in California and should be on the boat to Australia shortly. I've entered the Forgotten 500 class and the International Challenge races. Hoping to pick up the pace from last year. Think I can be competitive in my class and it would be great to qualify for the International Challenge races. Wow, hadn't heard that news. It has become a huge deal, including financially. It's still a great opportunity Martin, glad you're able to take part again. Good luck man. This could be the year of the Yanks down under! Mix of modern & vintage! Good to see your name in there Martin, something the Grandkids will be proud of. Should be a fun bunch. I remember Bruce from my Westwood days, many many moons ago! Best of luck Martin. Please keep us updated. ps I've entered the Forgotten 500 class and the International Challenge races. Hoping to pick up the pace from last year. Think I can be competitive in my class and it would be great to qualify for the International Challenge races. 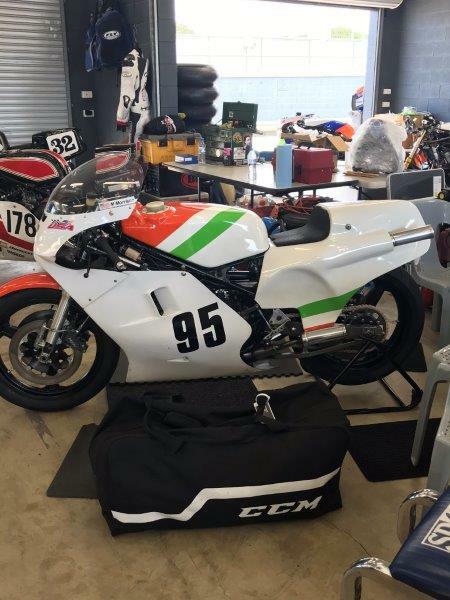 My mate is also racing P5 500 on a Laverda aswell as racing P4 Junior on his CB350. His name is Paul and will be with the rest of the West Australian team so say hi. He is the one building the engine for my CB500. 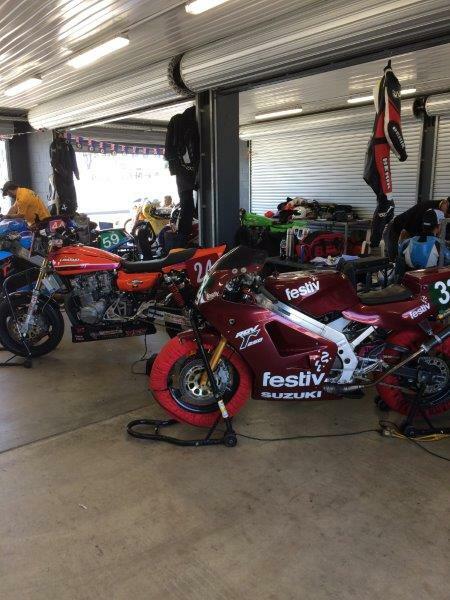 Here is a link to our racing facebook page to check the bikes out if interested. 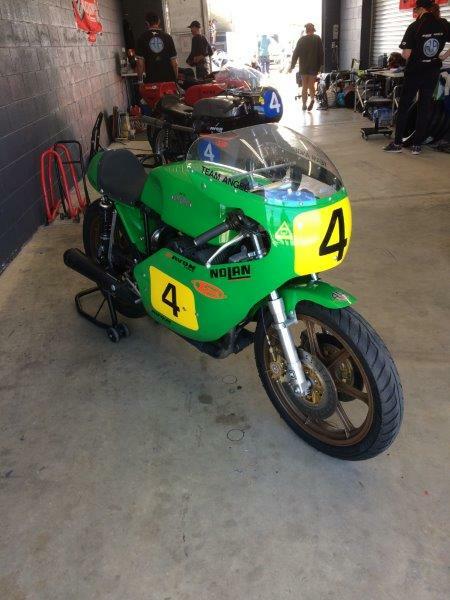 nice laverda, i won a couple of forgotten era championships on one of those . sadly it now lives in a spare bedroom and is used to dry washing on . Will be sure to look him up at the track. Checked last years results and Paul finished one better than me in the overall results. Ready to head down under for some holiday time with the wife before the races. It is a good time to trade winter for some Aussie sunshine! Good Luck Martin. Have fun man. Thanks Brent. Super excited about the races. After the long flight I am down under. On holiday with the Mrs. for a week and then on to Phillip Island. 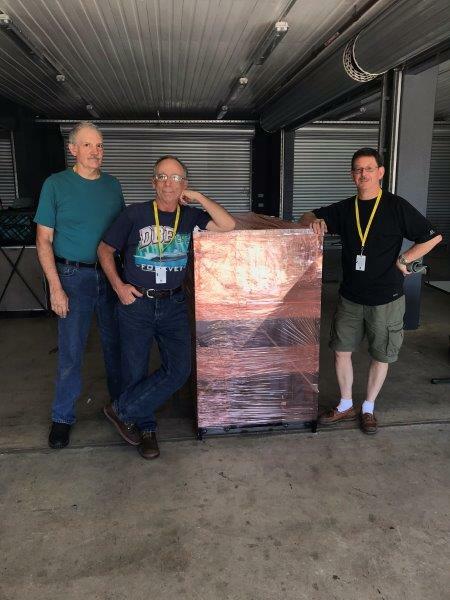 Here is the latest press release announcing the team from New Zealand. 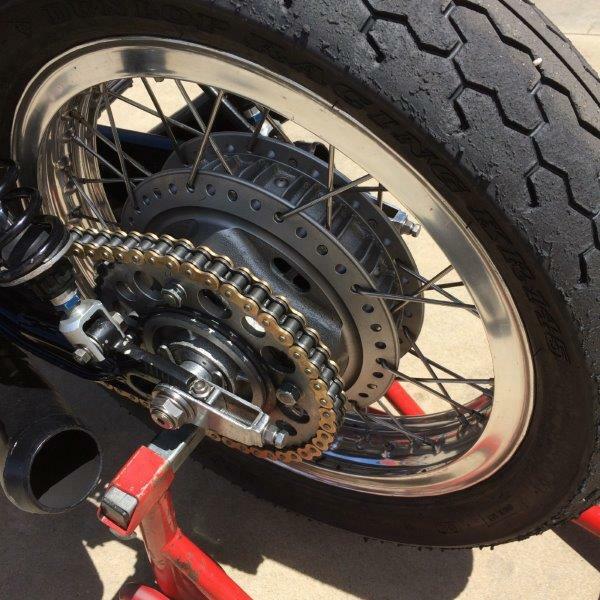 Marty had a get-off in someone else's oil Wednesday, but wasn't too badly hurt and the bike was repairable. He bounced right back the next day. Showing 6th in class, pretty impressive. 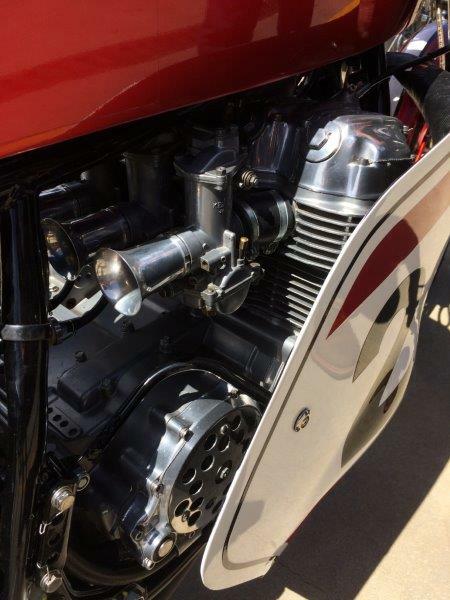 Yeah the Vincent is a loose term, but dammit that old engine is a great platform for what lurks beneath! Back in the USA from my trip down under. My laptop is in for repair, so no pictures at this time. Have a bunch and will post asap. My Suzuki runs in Forgotten 500 Era. The competition is a Patton 500 riden by local hot shoe Tom Bramich and a gaggle of TZ350's. In the same race is a second class, Unlimited Post Classic. 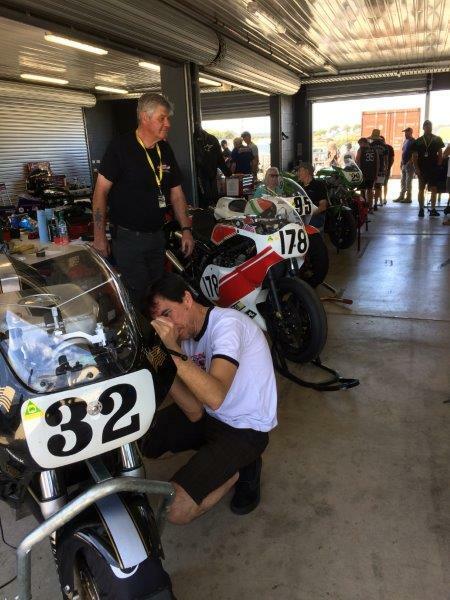 The fast bikes in UPC include Aussie stars Beau Beaton on a 1300cc Irving Vincent and Dean Oughtred on a 1000cc Honda CR. 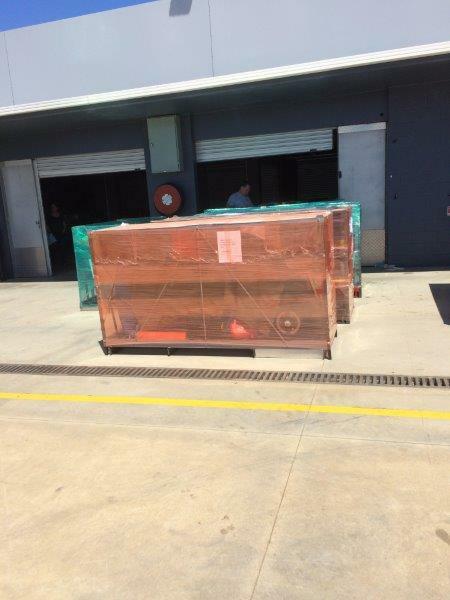 We arrived at the circuit Wednesday to unload the shipping container and uncrate the bikes. Always a relief to see your toy has arrived undamaged. The weather was sunny and warm, reaching 90 degrees in the afternoon. New for this year was the ban on leaded fuel. Most of the American team was using VP Roo99 for the first time. My first practice went well. Jetting seemed a little rich, but my Suzuki RGB500 was driving off the corners well and pulling in 6th gear. My best lap time was a 1:59. Not too far off my best from last year of 1:55. The second practice was going well and then disaster struck. Coming out of turn 4, tightest corner of the circuit the yellow flags were flying. 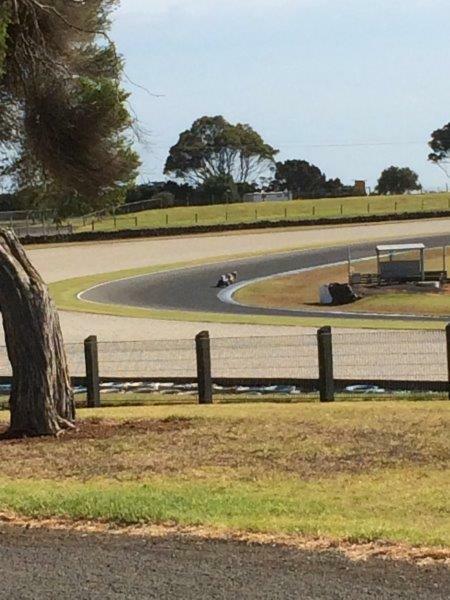 I could see a rider had gone down in turn 5 and was in the gravel trap. 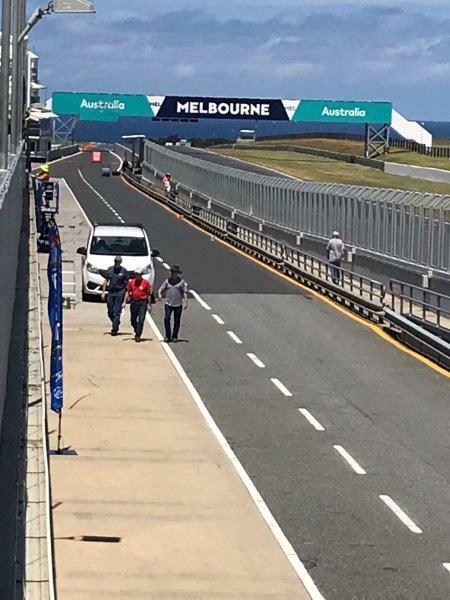 No debris on the track and no oil flags. As I tipped it into 5 the front wheel lost traction and I was down. Landed on my left shoulder, slid into the grass, and tumbled into the gravel trap. After I picked myself up I discovered the other rider was fellow USA team member Steve Rapp. It was oil from his FJ1200 I had fallen in. A visit to the medical center confirmed no broken bones, just a very sore shoulder and ribs. The bike was already back in the garage when I returned looking much worse for the wear. 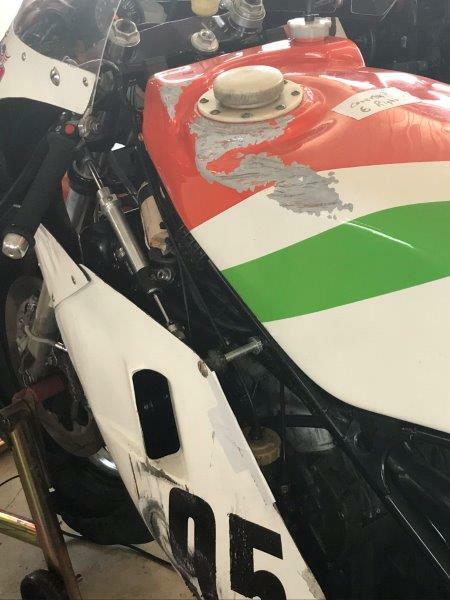 All the damage was to the left side, including fairing, wind screen, fairing mounts, gas tank, seat, foot peg, shift lever, and silencers. The gravel trap had really beat it up. After assessing the damage my two spanner men started the disassembly and repair process. There must have been a bucket of gravel in the fairing, nooks, and crannies. Fortunately we were able to repair or replace the broken and bent parts. The fairing was repaired with several yards of duct tape. A trip to tech and we were cleared in time for the last round of practice. 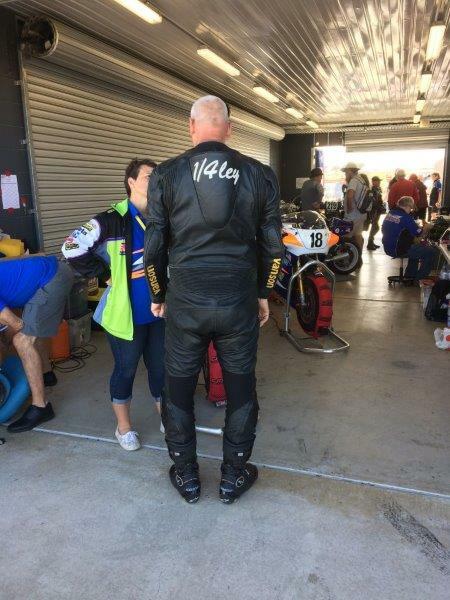 I struggled back into my leathers and made the last practice. Did a couple easy laps and found the shoulder okay, but the carburetion was off a bit. Pulled into the pits and was shocked to discover the belly pan full of race gas! One of the left side carbs which had been off to clean the debris either had something stuck under the float needle or had been reassembled incorrectly. It is possible the float arm was under one of the floats preventing the float needle from shutting of the gas. What a disaster that could have been. Crashing again or going up in flames! At that point I was feeling very lucky to have avoided both of those possibilities. Time now to regroup, recheck all our work, and get ready for Friday's qualifying and first 500 race. Friday was another beautiful day, sunny and hot. 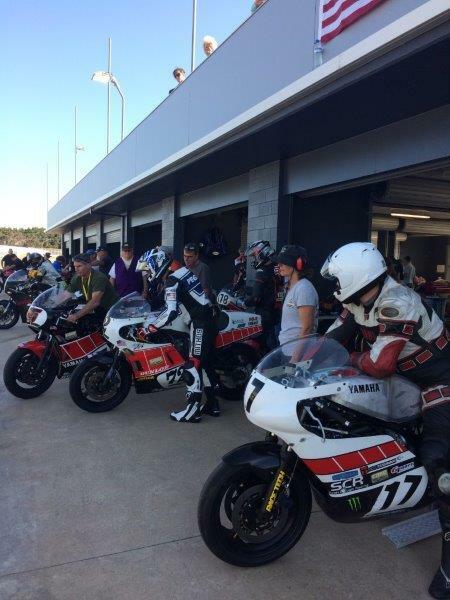 Each class has one 15 minute qualifying session and Forgotten 500 was third Friday morning. We arrived early to warm the engine and let the tires get toasty in the tire warmers. Two friends and former two stroke racers were helping and referred to themselves as chief spanner man and spanner man. 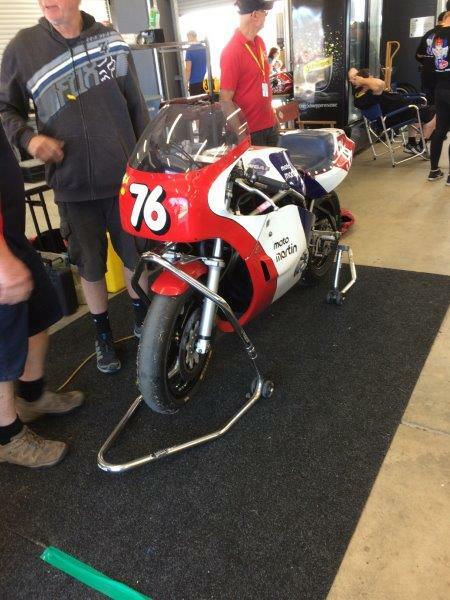 They took the bike into the paddock to warm it up while I chilled in the garage. Ten minutes later they returned having been unable to start the bike. We pulled the spark plugs and confirmed we had spark. Put a new set in and tried again on a set of roller starters. Still no luck. Then the spanner man asked if the carb covers were still in place. Of course they were! Once removed the bike fired and slowly cleared all the excess fuel. We had just enough time to warm the engine prior to the start of my qualifying session. 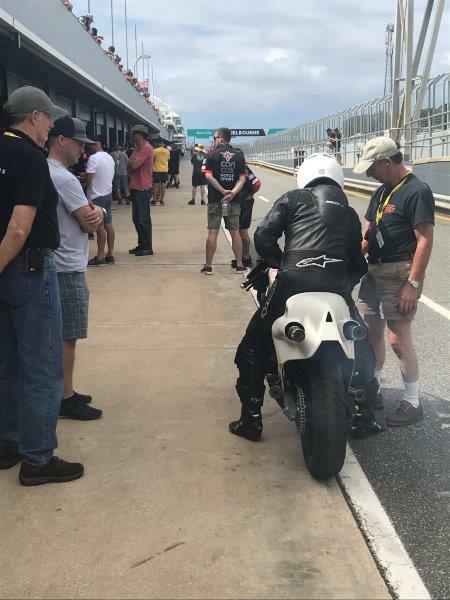 The bike ran well in qualifying, but unfortunately the rider was slow. Seems to take me a while after a crash to get going again. My best lap was a 2:03 which was 8th in class and 17th overall. Fastest in class and 2nd overall was Bramich on the Patton at a 1:49. 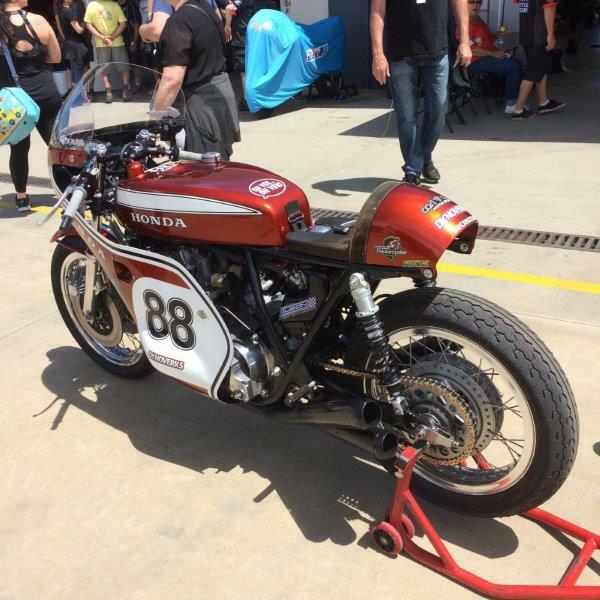 Dean Oughtred on the CR 1000 also turned a 1:49 flat to lead the Unlimited Post Classic class. My grid position was the middle of row 6. I also entered the International Challenge race with the fast boys. After the two qualifying session my best time was a 2:00. The minimum time to compete in the class was 1:55. Fast qualifier for the International Challenge race was Aussie Aaron Morris at a 1:37. Jason Pridmore lead the Americans in 2nd, with Josh Hayes 6th, and Larry Pegram 10th. Beau Beaton on the Irving Vincent was 7th at a 1:38. 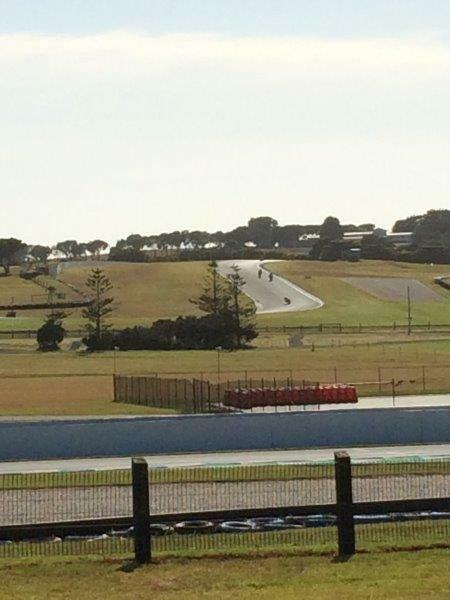 A fast Australian Superbike gets around Phillip Island in 1:33. 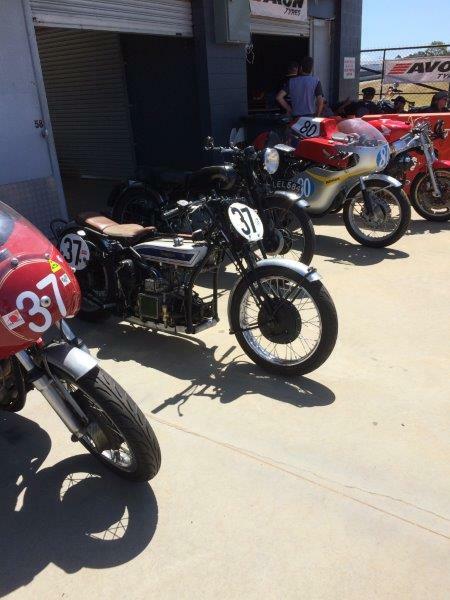 These "old" guys on vintage bikes are not messing around. My first race in the 500 class was a 4 lapper late Friday afternoon. I got a good launch and made up a couple positions going into turn one. At the end of lap one I was in 13th overall. 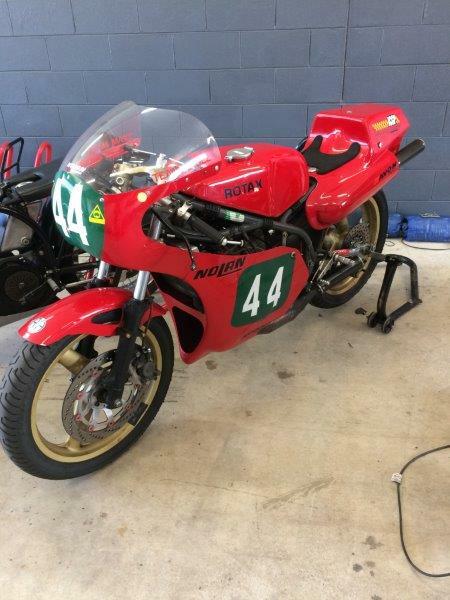 Had a good race with a Laverda and Ducati going until they gapped me. Ended 8th in class and 14th overall with a best lap of 2.01. 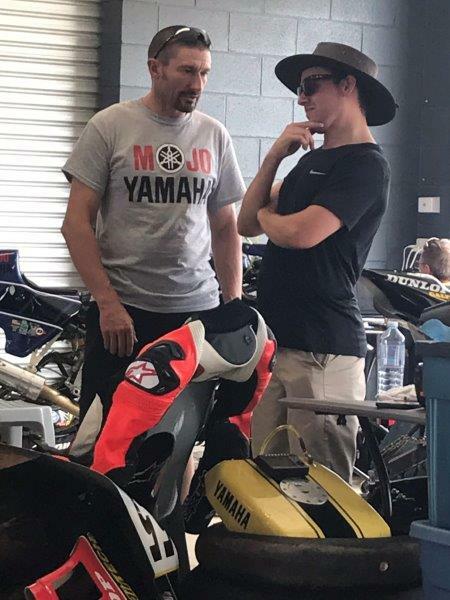 Beaton on his "slower" Vincent won the UPC race turning 1:44s and Bramich on the Patton took the 500 class Turning 1:48s. At the end of the day it was time to regroup, get some dinner, and rest my sore shoulder and ribs. Her is a link to Roadracing World's article. Please tell me you will be uploading an album of all the tasty SOHC Hondas you spotted over there?! Lots of pictures as soon as I get my laptop working. A cold front passed through Friday evening and the weather Saturday was spectacular, sunny, no humidity, and temps in the 70's. First up was the 5 lap race 2 of Forgotten 500. Grids are set by qualifying, so same starting position. 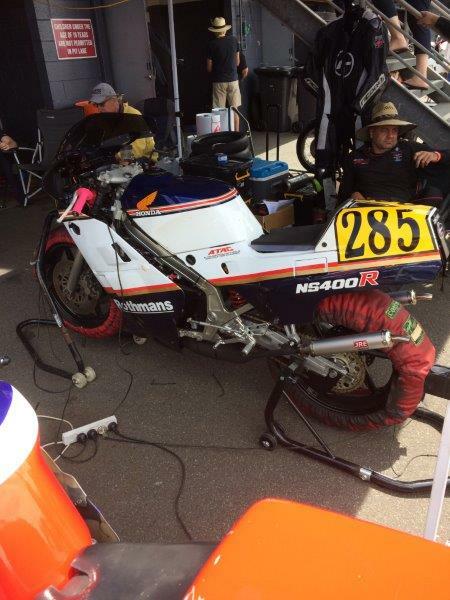 Got another good start and was in 10th the first time we crossed the finish line with a Laverda 500 behind and a TZ350 ahead. On lap 2 an Unlimited Post Classic CB902 came by in the section known as Siberia. I'd gain back on the front straight what I lost in the turns, but could not get back by. Finished 6th in class and 11th overall. 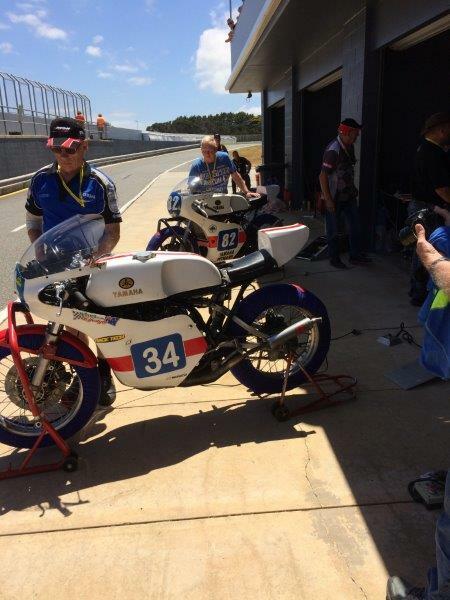 Out front Beaton on his Vincent led Oughtred's CR 1000 home in the UPC class. One second back was 500 class winner Bramich on the Patton. 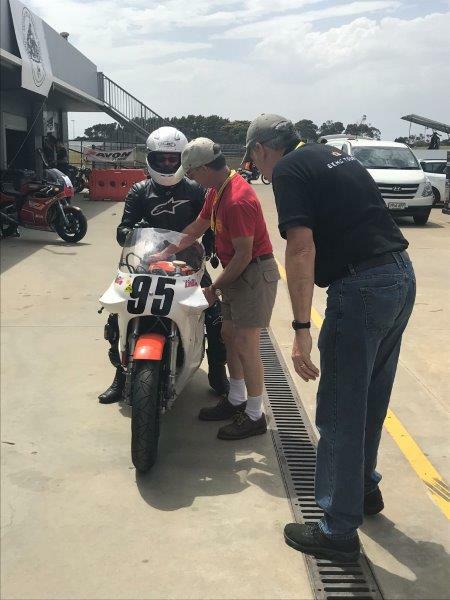 After the race I was excited to discover I'd lowered my best lap time to 1:55 and met the minimum for the International Challenge race. 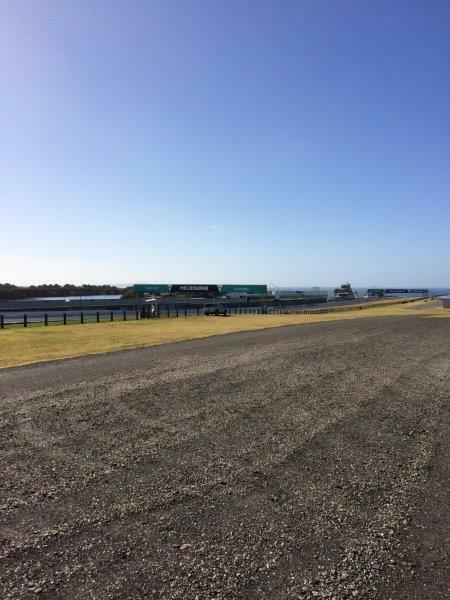 As the grid for race 1 of the International Challenge race was already set I'd be spectating. Race 1 of the International Challenge race was next. A six lap sprint. We watched the race from the garage roof. On lap 2 as the leaders came through the high speed last turn onto the front straight disaster struck. Jason Pridmore appeared to be in 3rd place when he high sided. 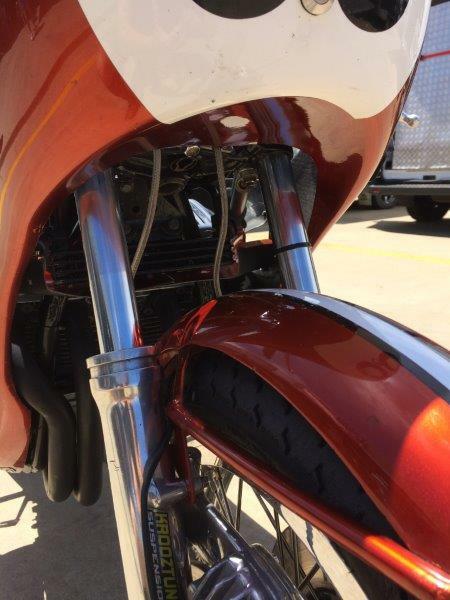 Beau Beaton was right behind on his "fast" Irving Vincent and slammed into Jason's FJ1200. We next saw the Vincent high in the air and then cart wheeling across the run off area. The race was red flagged. Later I learned Jason had broken his leg and Beau had a fractured hip. 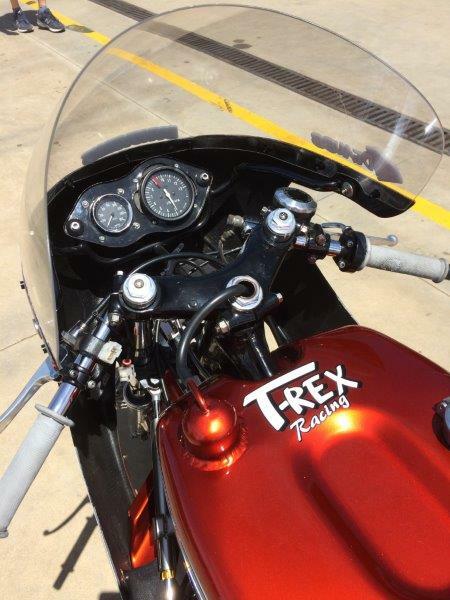 Aussie Aaron Morris won over a T-Rex 1982 Honda 1000 in second and Josh Hayes in third. The spread from first to third was 1.6 seconds. Also in the top 10 was Larry Pegram in 8th. As an alternative I was last on the grid for the International Challenge race 2. I made a good start and was with the pack going into turn one. After that it was a lonely race as the field pulled away. On lap 4 I started seeing blue flags and thought are you kidding me. The leaders are going to lap me in a 6 lap race! Not wanting to be the guy who affected the outcome of the race I got to the inside of the track and then pulled onto pitlane. For the second race Aaron Morris took the win. Team USA did better with Hayes in 4th, Cycle World writer and Moto America racer Michael Gilbert in 6th, Steve Rapp in 7th, and Barrett Long 10th. Pegram had been top 5 until he ran off the track. The third Forgotten 500 race was 4 laps and the next to last event of the day. 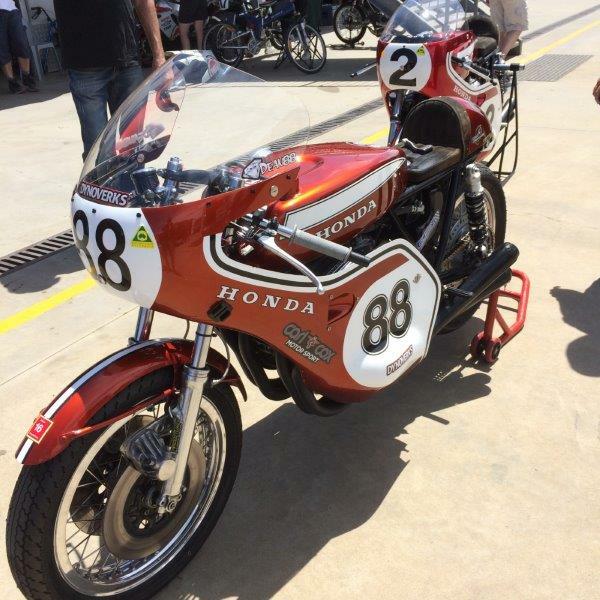 With Beaton and his Vincent out, Dean Oughtred on the CR1100 Honda had it his way in the UPC class. The 500 race was much closer with a TZ350 half a second back from Bramich's Patton. 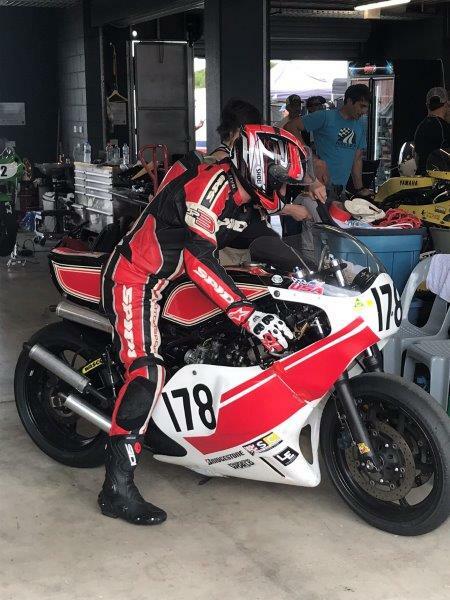 I led the CB902 that beat me in race 2 home for 6th in class and 9th overall. All in all it was a good day. Left the track looking forward to Sunday. Sunday was anther beautiful day, sunny and moderate temperatures. First up was the 3rd International Challenge race. The only call is at 2 minutes. When it comes there is a scramble to remove tire warmers and use one of the two roller starters. 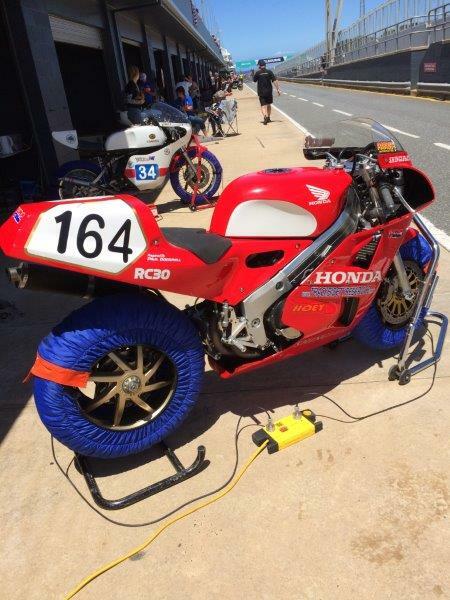 My two stroke 500 is an easy push starter so I avoided the queue for the roller starters. My grid spot was on row 11. Had another good start and stayed with the pack to Honda corner. From there I faded until the leaders caught me at the end of lap 5. When the blue flags came out I kept my speed up, but stayed to the left side of the track to be sure I'd not interfere with the leaders. Josh Hayes had an electrical issue and was never a factor finishing 15th. First through 4th was all Australia with Steve Martin taking the win. Pegram, Gilbert, and Rapp filled 5th through 7th with Long, Miller, and Quarterly just outside the top 10. My last Forgotten 500 race was my best race of the weekend. From row 6 my streak of good starts continued. By the time we reached Honda corner I'd made up 6 places and was 10th. Before returning to the start line I'd passed 3 more riders to reach 7th overall and 4th in class behind the Patton and 2 TZ350'S. For the next 4 laps a battle for 5th to 8th ensued. It was great to be competitive and racing for position. When the checkered flag fell I finished 7th overall and 5th in class. Oughtred's CR had a mechanical and Bramich on the Patton took the overall win and first in the 4 race series with a perfect score. I finished 5th overall for the series. The 4th International Challenge race was the high point for Team USA. Josh Hayes led start to finish to score America's first ever overall win. Pegram 6th, Gilbert 7th, and Miller 10th also scored for Team USA with Long 14th and Quarterley 15th. My race was a repeat of race 3. Points from the top 5 team members over the 4 race series are counted. 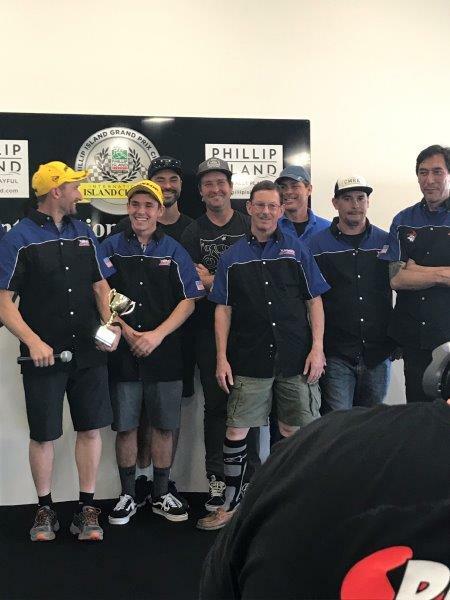 Aussie's Steve Martin and Aaron Morris took first and second in the series with Giles 4th, Ditchburn 9th, and Melcher 11th. For Team USA Josh Hayes was 3rd, Pegram 5th, Gilbert 6th, Miller 8th and Long 10th. 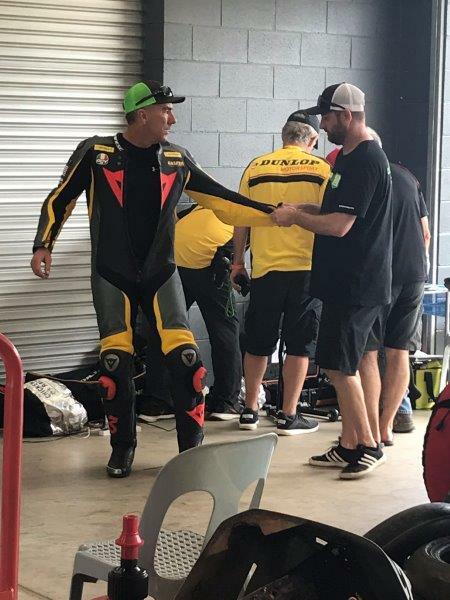 John Reynolds, UK Superbike star riding for New Zealand, was the Kiwi teams only rider in the top 10. I am very fortunate to have now participated in two Island Classics. One of my goals this year was to qualify for the International Challenge race. I'm glad I did, but must admit the class is beyond my skill level. Probably something to do with being 64 years old. Realistically the cutoff should be 1:50 as opposed to 1:55. My guess is too many of Team New Zealand would not make the cut at 1:50, so it remains 1:55. The good news is the vintage classes are mostly old guys like me on old bikes. 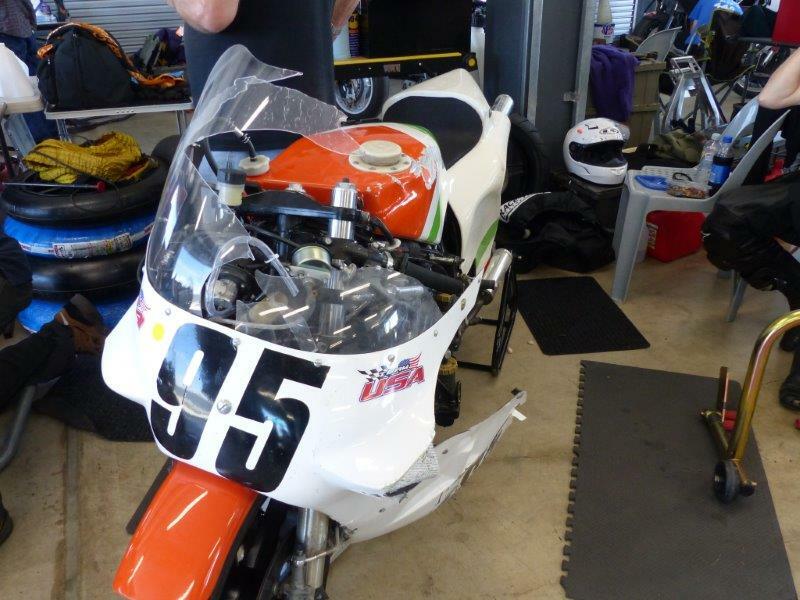 A good AHRMA or VRRA racer should be competitive. The facility is world class and the organizers treat you great. It is a fun event with friendly competition. This is definitely a bucket list event. Not sure I will try to participate in the future as there are other bucket list items competing for my time and money. Hope to have my laptop repaired shortly and post the pictures I took. Thanks for the great write-ups, look forward to the photos. Yes indeed Marty, proud of you brother. Have a lot of photos. Will post in 3 or 4 groups. A beautiful day down under. Front straight looking at the garages and ocean in the background. Too busy when you are on the track to appreciate the view. Down hill after Lukey Heights to a slow right. Fast turn leading onto the front straight. Real test of nerve! 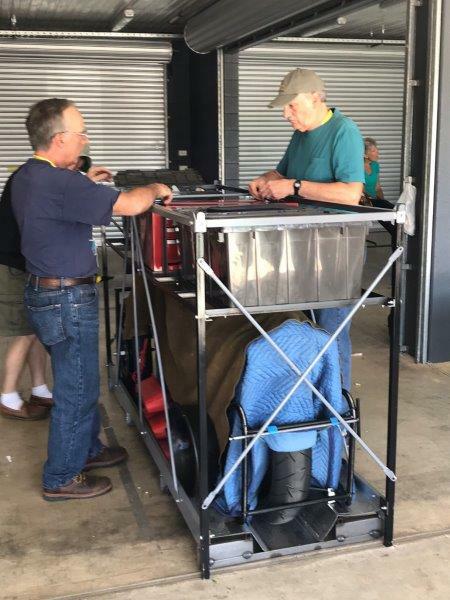 Larry Cook (engine builder for Mojo Yamaha) and Ralph Hudson (holder of 297 mph land speed record and owner of Jason Pridmore's ride) helping Larry Pegram start his motor. Dayton 200 winner Steve Rapp talking with Dave Crussell. 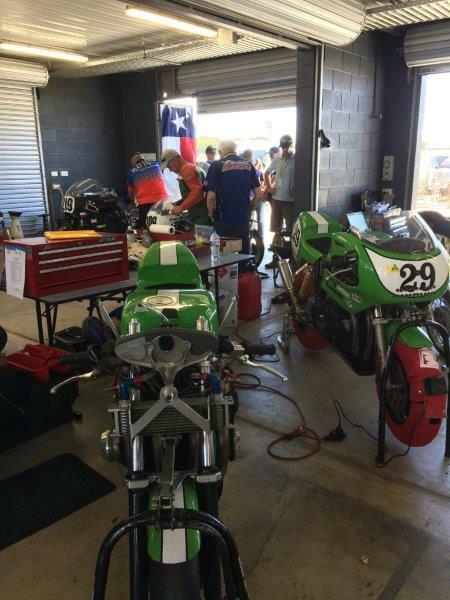 Joe Penthod fettling his Harris framed Kawasaki, Tony from New Zeland helping, Bruce Lind's TZ750, my RG500, and Barrett Long's Kawasaki's. 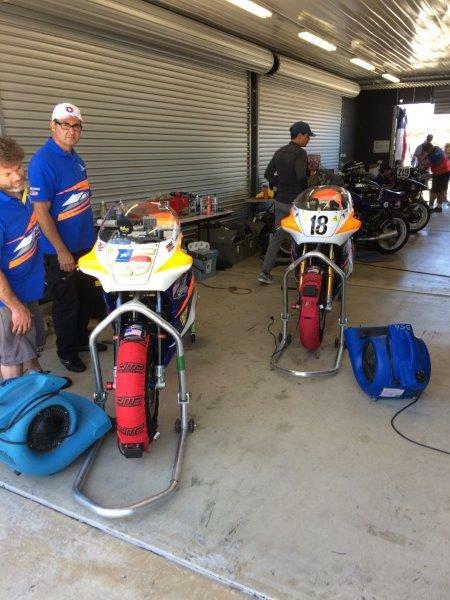 Carey Andrew's rides for Dale Quarterley and Mark Miller. 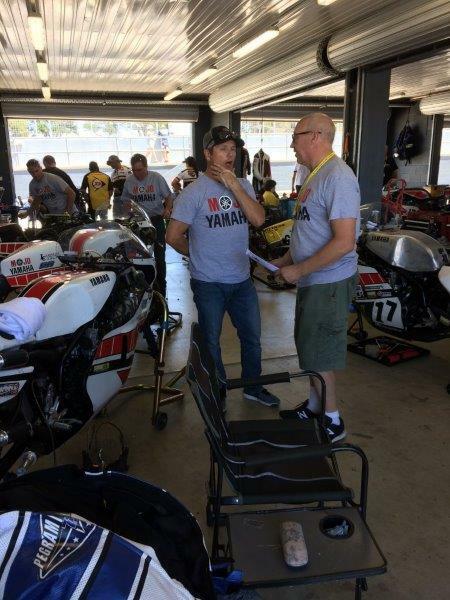 Four time AMA Superbike Champion Josh Hayes and his Mojo Yamaha ride. 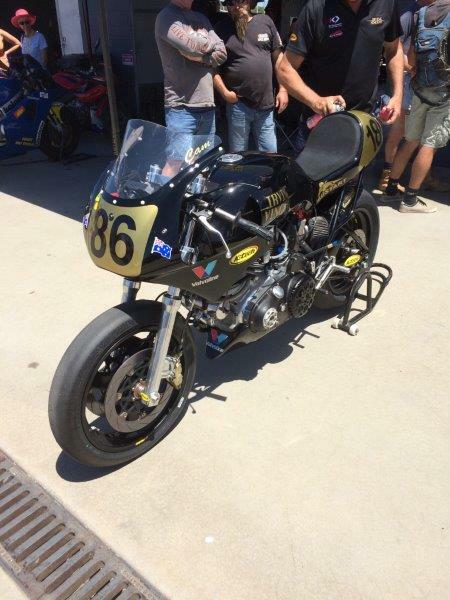 Tim Joyce and the Manx Norton he road to 2nd in class. He tied with the winner on points, but lost the tie breaker. If you haven't guessed, Dale Quarterley. 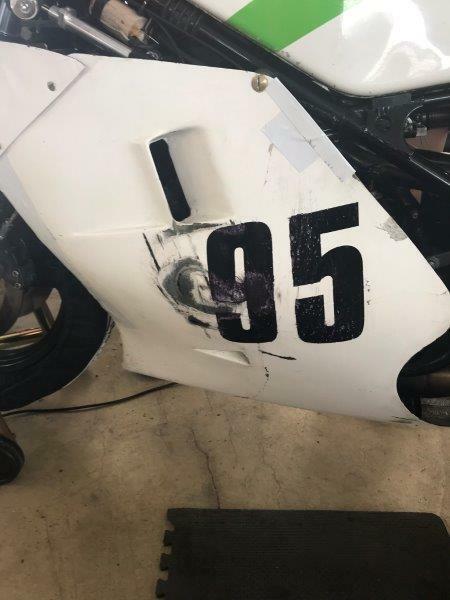 Ralph Hudson's Yamaha post Jason Pridmore crash. Maybe the engine is salvageable. Here is video of Jason's crash. Jason is in 3rd and Beau Beaton on his "fast" Vincent in 6th on lap two. I cringe every time I watch this. 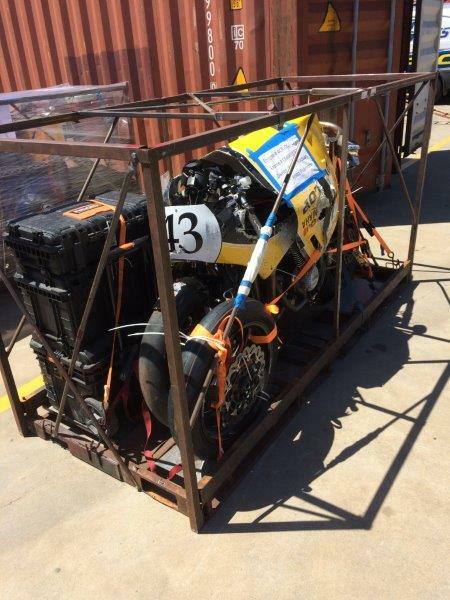 My Suzuki all crated for the boat ride back to the USA. 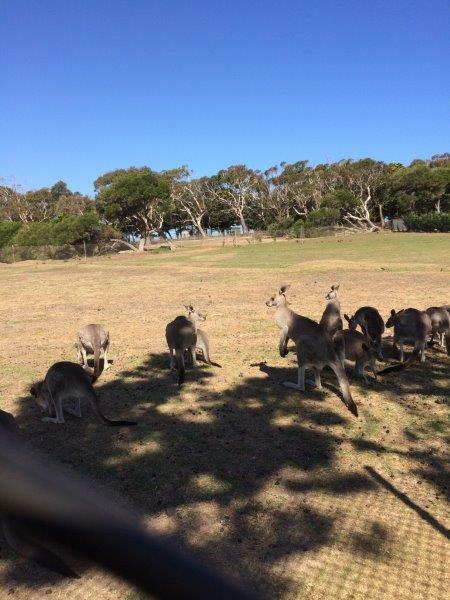 The resident roos! Dodging gulls is bad enough, would ruin your day to find one of these on the course. Pretty sure this is you we are looking at Marty? It sure is. 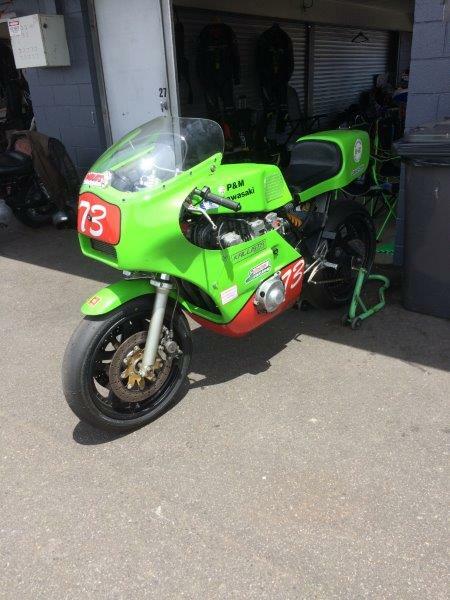 Paul is really flogging that Laverda and making up time in the corners! Think it is race 2 on Saturday. 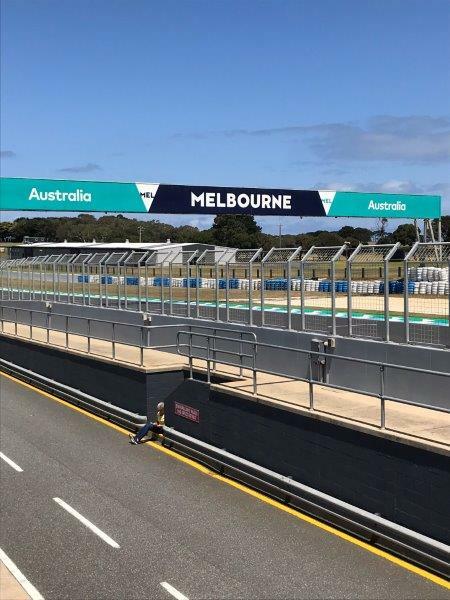 A couple pictures of the front straight taken from the garage roof. Thursday morning before the crash. Jason Pridmore, also before his crash. My RG repaired post crash. Bummer! Something to fix when the bike returns from the long boat ride home. New fairing is on order. Handing the bike off to my "spanner men". 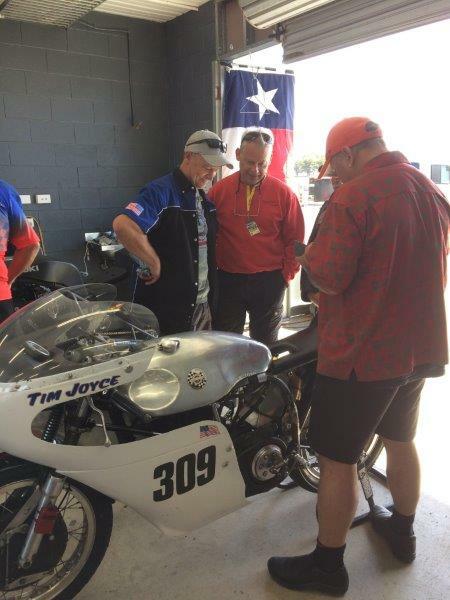 Craig Morris (former AMA 250 lightweight winner) and Bruce Teague (the brains behind Craig's winning 250. Bruce also spent two seasons in Europe in the 70's tuning for Alex George and Bruno Kneubuhler). 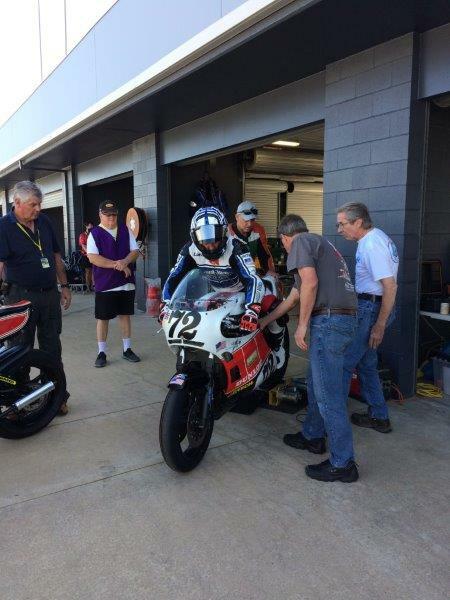 Bruce Lind on his TZ750. 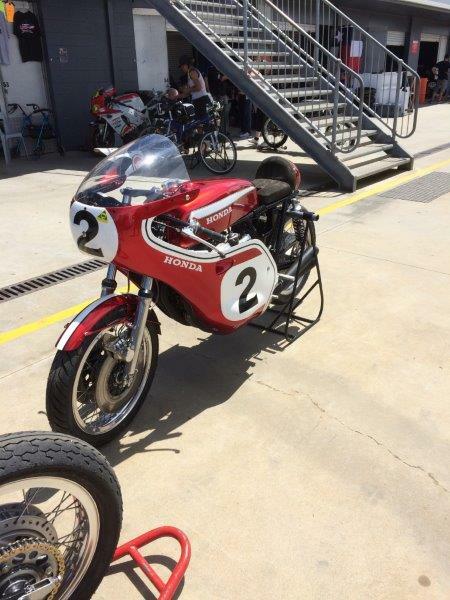 Same bike he raced in the AMA Formula One back in the day. Mad scramble at the two minute warming for the International Challenge Race. Josh Hayes and Michael Gilbert of Cycle World. Warming up in pit lane for the next race. Team USA International Challenge riders. Team USA riders and crew. Putting my baby to bed for the long trip home. Tnxs for the comprehensive report, pics, vids and compliments on soldiering against all the difficulties. Jason's crach looks pretty bad, did the bike hit him at the last tumble? How is he? yes thanks for the great reports , i always enjoy your posts . Thanks Guys. I'm not sure if the Vincent struck the rider who is down on the left which I think is Beau Beaton. It is hard for me to tell which rider is Beau and which is Jason. Jason broke the fibula and tibia in his lower left leg. He has had two surgeries and is in an external fixture. I understand Beau cracked his pelvis. The good news it appears both will recover from their injuries. It was a scary crash! Listened to Jason describing what happened on a pod cast yesterday, he sounded in good spirits. 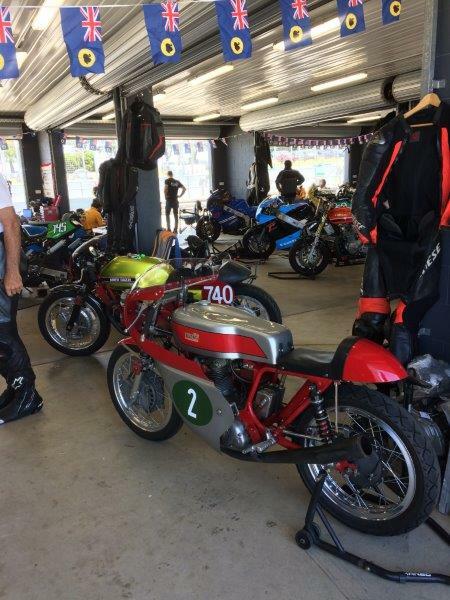 Pictures of interesting bikes in the paddock and garages. Hope you enjoy. 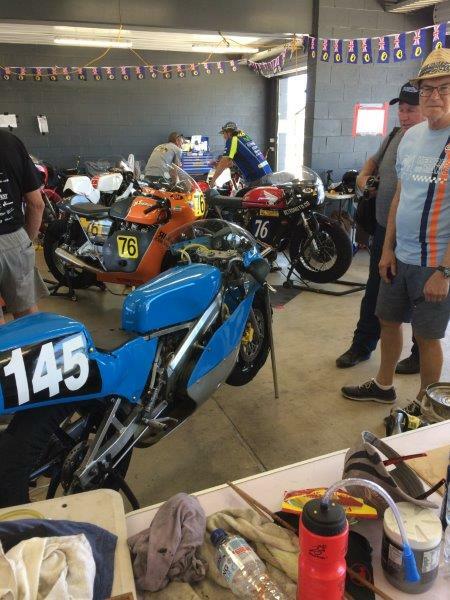 1990 Honda RS125 and Paul Smith's 1972 Honda CB350 and 1979 Laverda 500. Raced with Paul in the Forgotten 500 class. It is his video on the previous page. 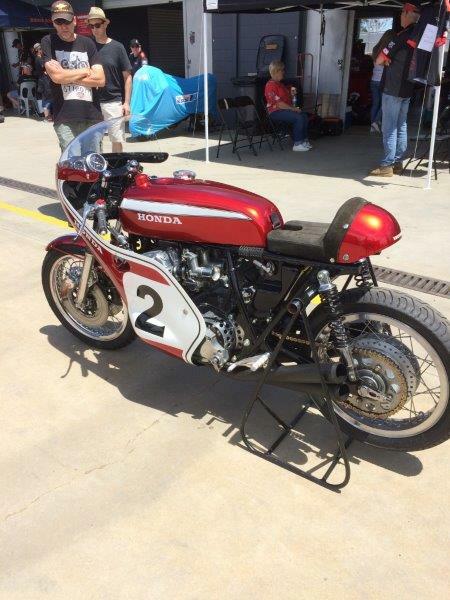 Beau Beaton's 1955 Irving Vincent 1300cc. This is his "slow" Vincent he raced in the Forgotten 500 class. 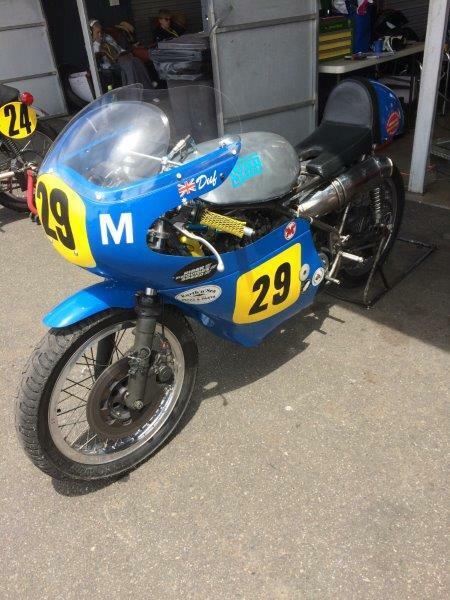 Not the 1982 Irving Vincent he crashed in the International Challenge race one. 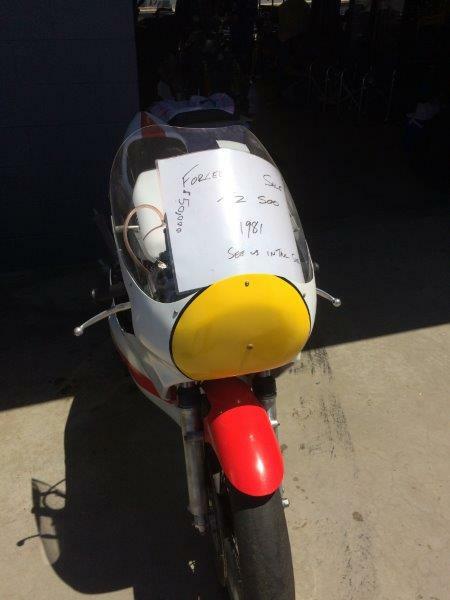 Fancy a 1981 Yamaha TZ500 for $50,000 AUD? 1977 Yamaha TZ350's. My competition in the Forgotten 500 class. 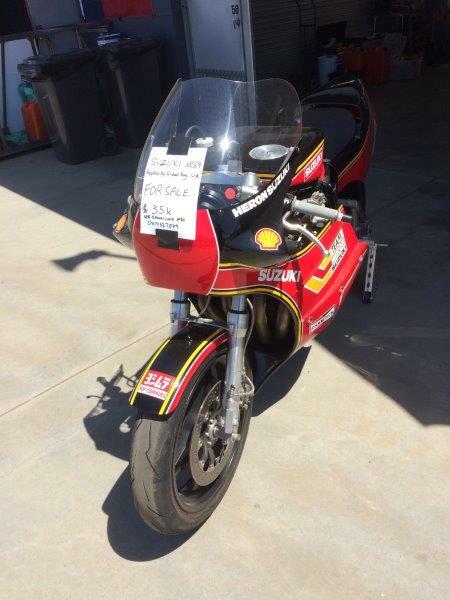 Or a Suzuki XR69 for $35,000 AUD? Think the second bike is a Triumph. 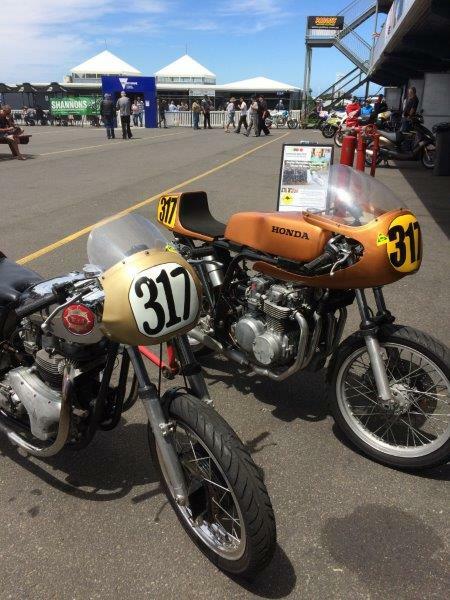 The first Honda is a 1962 CB77 305cc and the second a 1988 RC30. 1960 BSA 650 and a 1971 Honda CB500. 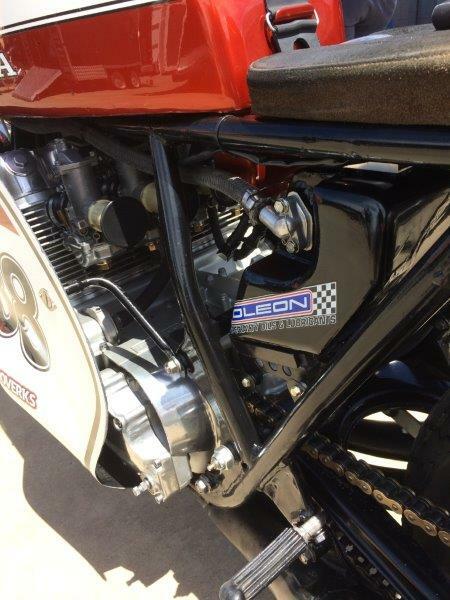 1978 Kawasaki Z900 (1200cc) in a Peckett and McNab Frame. 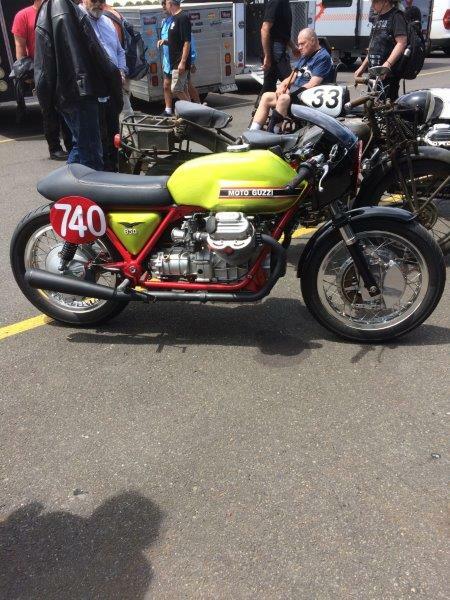 1972 Moto Guzzi V7 Sport 850cc. 1971 BSA G50 in a Seeley frame. 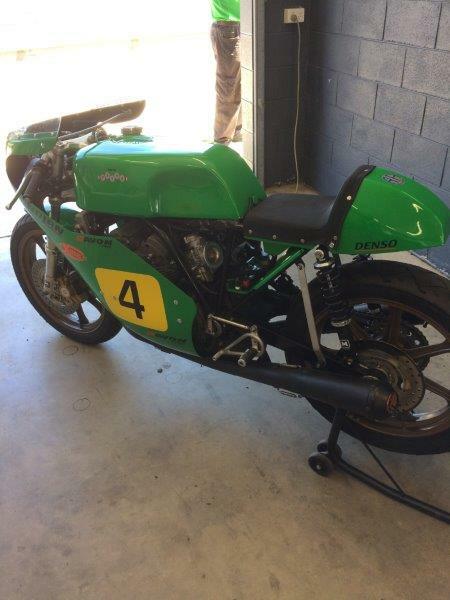 Moto Martin frame, not sure of year or power plant. 1973 Patton BM3. Winner of all four races in Forgotten 500 class. Mikuni smooth bores and a dry clutch? 1970 Honda CR 750 (1000cc). Assume that is not a stock rear hub. Smooth bores and a very clean engine bay. Dunlops on the CR Martin? I think you are correct. Looks like KR124’s on #88 and Avon’s on #2. Can anyone confirm if that is a dry clutch on #2? Great write ups and photos. 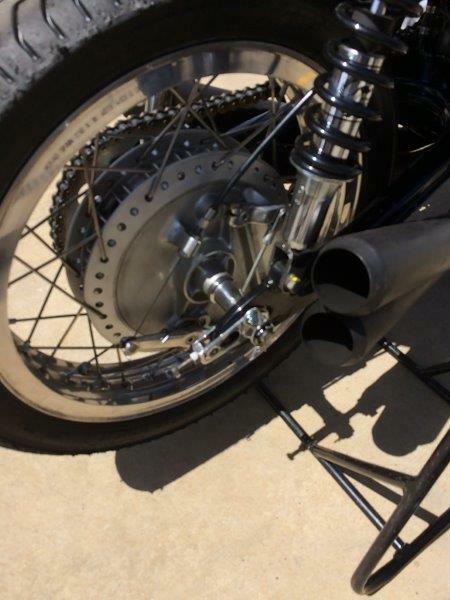 I think you will find that the #2 bike is running a conventional type clutch with a custom outer cover with holes in it. If you look close, you can see the 3 fastener holes for the cover plate line up as matching the factory clutch housing. The 3rd pic is of the “Sutton” dry clutch for reference. Received a couple photos of my Suzuki post crash. Did not think to take any myself as I was into repair mode. Brings a tear to my eye. Look closely at the number 1 carb. That is a stone lodged in it! Not groovy. Did you find it ingested anything? After the gravel trap capture at Barber I found stones absolutely everywhere. 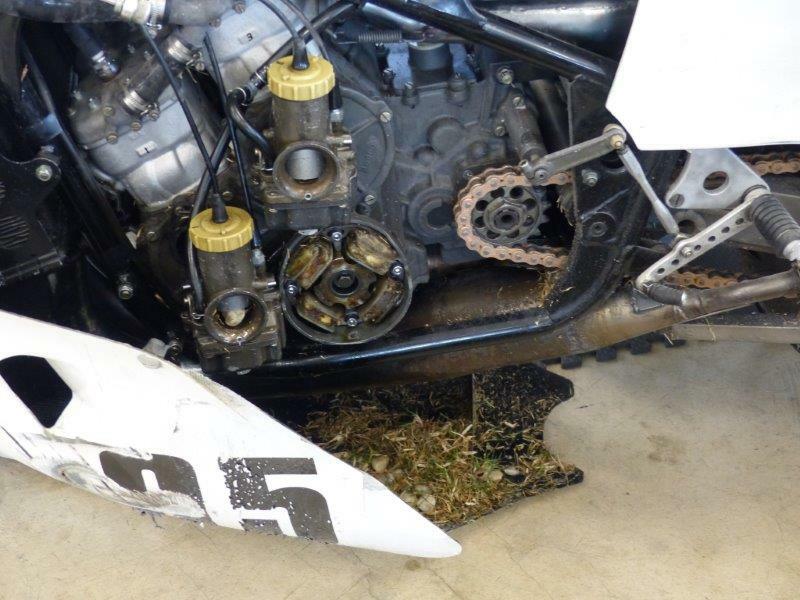 takes me right back ..... i spent many a dull hour digging mud out of rg cases and looking in gravel traps for a pair of carbs ! A small amount of debris in the intake. Cleaned as best we could and reassembled. Thankfully ran fine the rest of the weekend. The cranks have reached their service limit of 1,200 miles. Time for rebuilds. With the passage of time the memories hurt less. Australian TV coverage of the International Challenge races is now available on YouTube.